Like many a future favourite, Young Peculiar’s first release is a grower that requires more than a cursory listen. The first thing to impress is the musicianship from all corners, which is forthright and nuanced, often undergoing stylistic changes within and between songs. The band’s mixture of angsty pop vocals, intricate fretwork and forays into disco-ncerting, octaves-addled grooviness can be a bit much to take in at first, especially since there is modest space on a four-track EP to execute these ambitious manoeuvres. Then something sublime gathers shape. All the studied genre cues merge together under the helm of Bernadette Dales’ frustrated personal songs, leading to unusual music/lyric juxtapositions. The songs themselves all involve Dales on the emotional back foot, burdened by commitment, lust or pessimism. ‘Red and Gold’ sets the tone, phrasing a young couple’s long-term relationship as ‘A ball and chain of a different name/Disguised as loyalty’, the protagonist pleading with their other half to give up security for the unknown while they are still naive. Next, ‘Way With Words’ and ‘Chemical Comedienne’ act as companion pieces but with genders switched round. ‘Words’ examines the self-destructive compulsion to revisit a bad ex, one that you never really got over, and closes with the damning refrain ‘I’m free/But I still believe’, a final defeat. ‘Chemical Comedienne’ meanwhile is a warning to a friend over their old flame’s corrosive manipulating. It’s the anti-‘She Loves You’, played Talking Heads, and an immediate stand-out. There’s also a gorgeous, proper pop bonus track in ‘PGRs’, replete with piano, strings and wistful memories. 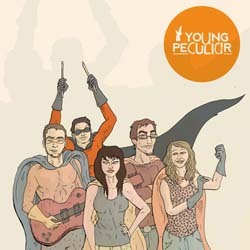 Bringing together the essence of pop’s finest guises, Young Peculiar are the mucky superhero gang their sleeve art depicts: talented, restless, tragic and contradictory. This exploratory EP points to bigger things from the group and hopefully wider acclaim.